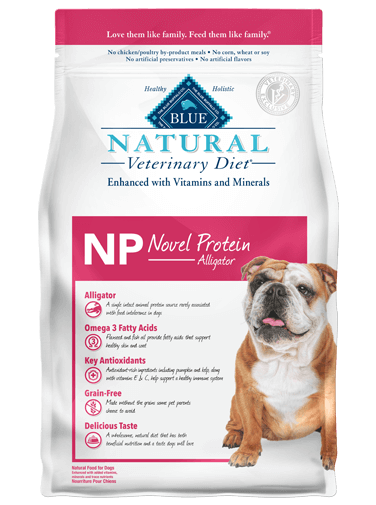 BLUE NP Novel Protein - Alligator is formulated to nutritionally manage inflammatory skin and GI diseases in dogs who experience adverse food reactions. Starting with alligator, a unique animal protein source, it’s the delicious, therapeutic way to help treat your dog’s food intolerance. Alligator - A high-quality, novel protein rarely associated with food intolerance in dogs. Delicious Taste - A therapeutic diet made with wholesome ingredients, plus a great taste to support a healthy appetite.